No strangers to stylish purchases, David and Victoria Beckham have splashed out on the latest designer item – two tiny micro-pigs! At a whopping £700 each, the tiny piglets don’t come cheap, but the couple couldn’t wait to get their hands on these little must-haves. The teacup size pigs are currently living in the lap of luxury, being pampered by staff at the farm on the couple’s Hertfordshire estate. And it seems that the stars are still trying to decide on names for these new additions to the family. Posh is said to be keen on naming them after the couple’s celeb friends, Elton John and David Furnish, while Mr B favours Pinky and Perky. The pint-sized pets are fast becoming a trend among celebs. Jonathan Ross and Rupert Grint both have some, and the Beckhams are just the latest to jump on the bandwagon. 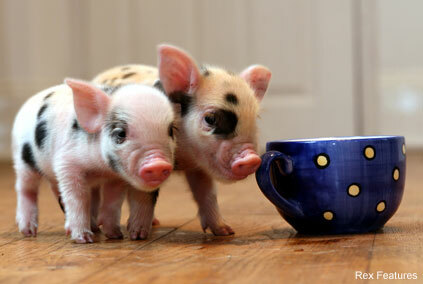 Demand for the teeny animals – which weigh just 9oz at birth – is rapidly increasing with their celebrity status. Breeder Jane Croft said, ‘We are inundated with inquiries every day. 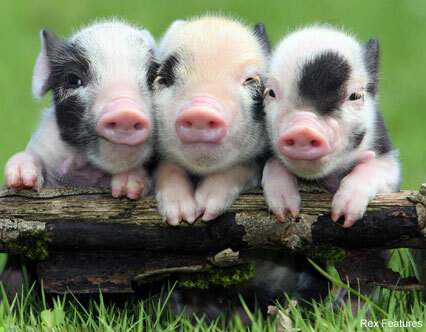 It’s amazing how popular they have suddenly become and how many want pigs as pets’. We’ll definitely be putting some on our Christmas list!